Posted on September 29, 2017 by Sara K.
Just a little bit north of Shoe Lake in the Goat Rocks Wilderness, Southern Washington. Everything I had heard and read about the Pacific Crest Trail in Washington had led me to believe that there would inevitably be horrible rain. 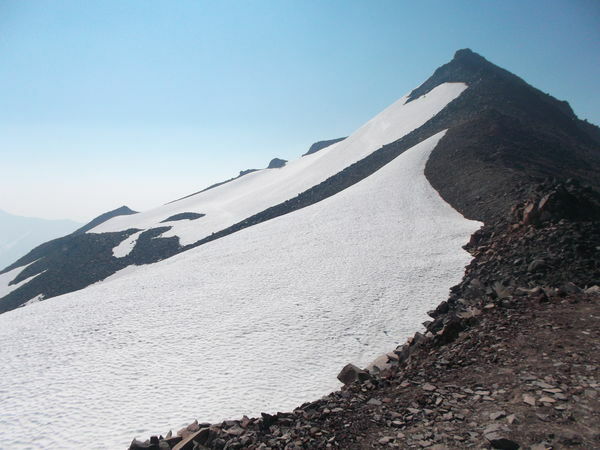 Temperatures in the Cascades in Washington are generally not supposed to be above 80 degrees Fahrenheit (27 Celsius). In my experience, it was fairly often above 90 degrees Fahrenheit (32 degrees Celsius). One guidebook says something like “it is very unlikely that you will be able to get through Glacier Peak Wilderness without experiencing a downpour, and if it only rains for one day then consider yourself lucky.” Guess what? When I went through Glacier Peak Wilderness, the weather was totally dry – not even a hint of rain. See those switchbacks? That is the trail ascending from Milk Creek Canyon, Glacier Peak Wilderness, Northern Washington. 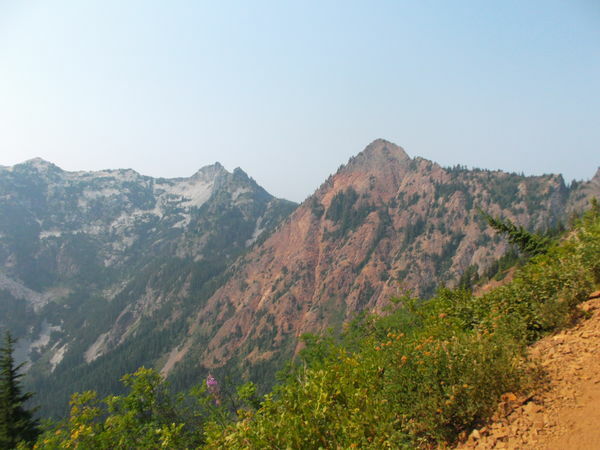 When I hiked up out of the canyon of Milk Creek, which is the steepest northbound uphill segment of the PCT in the entire state of Washington, the trail had already been baked in the sun for a few hours. It was sunny, shade was limited (though still more abundant than in many Southern California sections of the Pacific Crest Trail), it was hot, and very dusty. 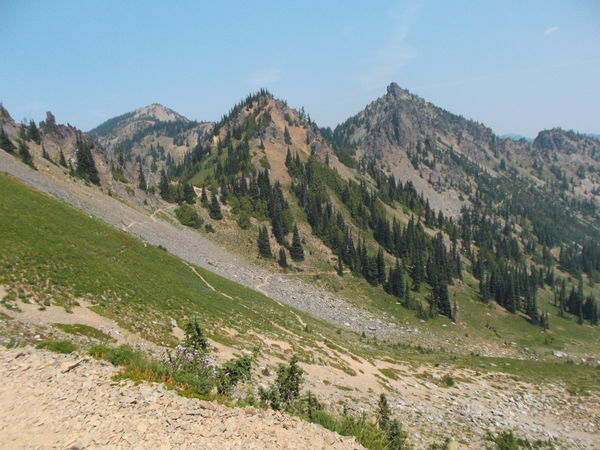 The Pacific Crest Trail in Washington is advertised as being cold, wet, and muddy, not hot and dusty. I felt like I had been teleported back to California. I was surprised by how dry, dusty, and warm this ridge was, but at least it had good views of Mt. Hood, Mt. Adams, and Mt. St. Helens. Indian Heaven Wilderness, Southern Washington. That said, most of the time, the heat did not seem so bad. Most of my hiking experience has been in Taiwan, which has hot and humid summers (and yes, I went hiking in summer in Taiwan, even though some people say summer hiking in Taiwan is dangerous – I think that, as long as one’s body is acclimated, and one carries plenty of water, hiking in summer isn’t any more dangerous than hiking in any other season in Taiwan), and in California, which is known for its dry, warm weather. So when local hikers were telling me that it was a heat wave, and that it was oh so terribly hot, and 10 miles (16 km) was an awfully long distance to hike without passing any water sources, my response was ‘Heat wave? 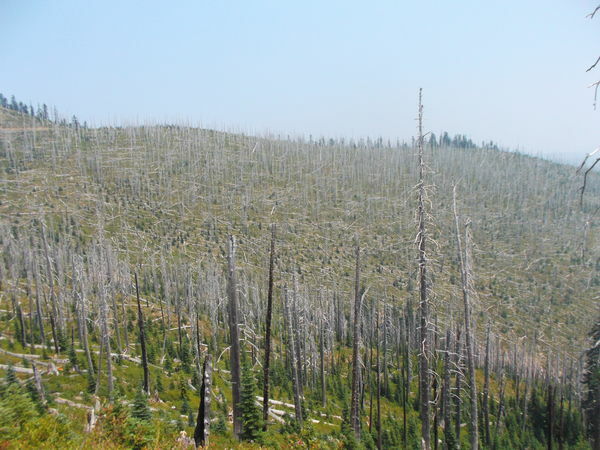 What heat wave?” It didn’t seem that bad compared to the California Pacific Crest Trail. Even in Northern California, never mind Southern California, going 10 miles without water in dry heat is not unusual on the Pacific Crest Trail (to be fair, hiking for 16 km without any water sources would be unusual in Taiwan). (Also, these local hikers were clearly from Western Washington, since Eastern Washington often gets hot weather in summers). 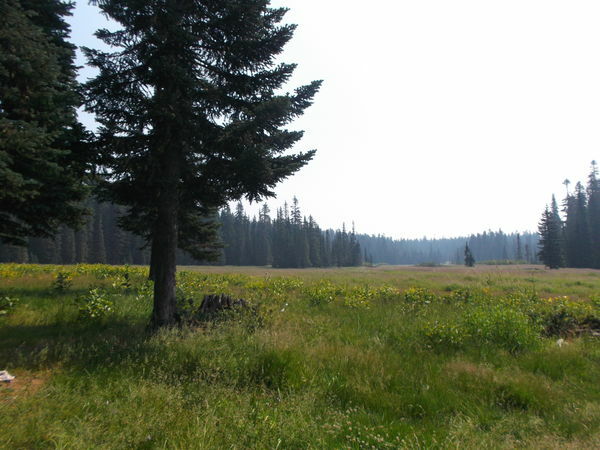 Government Meadow next to Urich Cabin, Southern Washington. One of the local teenagers I met hear complained about how hot it was. I was mystified because I didn’t feet it was hot at all – even compared to my experiences in Washington up to that point, it was not particularly warm at that time and place. That is not to say that the heat and water situation never got to me. 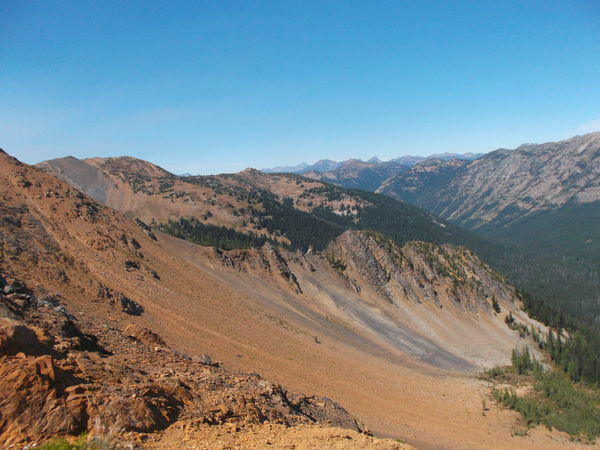 I remember that, northeast of Sheep Lake near Chinook Pass, there was this 8 mile (13 km) stretch without water. 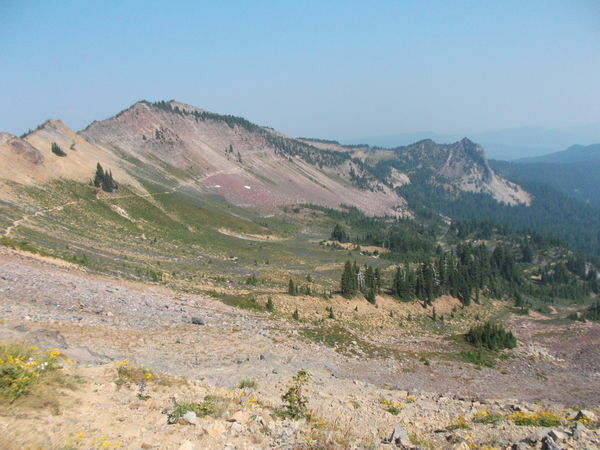 Ordinarily 8 miles without water would not be a big deal, but leaving Sheep Lake is a steep uphill (which discourages carrying lots of water), followed by exposed trail with little shade over very rocky terrain that is baking in the sun, and the rocky terrain slows you down. That was a tougher water carry than any of the 10+ mile waterless stretches I did in Washington. Here is a photo from that waterless stretch between Sheep Lake (Chinook Pass) and that Wonderful, Amazing, Superb, Desperately Needed spring near Big Crow Basin. I think almost all northbound hikers were filled with joy when they reached that spring that ended the rough waterless stretch. 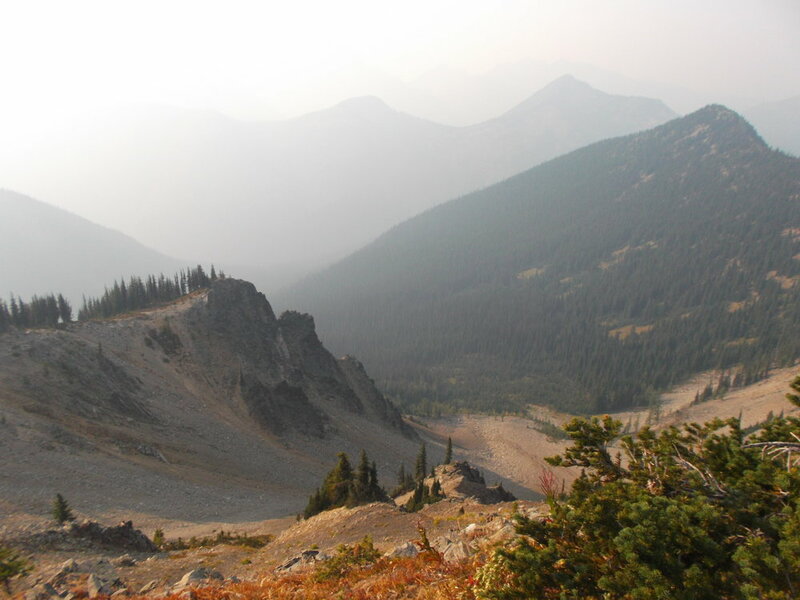 In particular, the heat and smoke got to me in the very last section of the trail, between Rainy Pass and Canada. I could understand having some dry, warm, and waterless sections in Southern Washington, but I had thought I would be done with those issues in Northern Washington. And I didn’t have any long waterless stretches in Northern Washington … until I reached the VERY NORTHERNMOST PART OF WASHINGTON. On top of the heat and the 10+ mile waterless stretches, there was also a lot of smoke in the final 50 miles of the hike. Near Tatie Peak, southwest of Hart’s Pass, Northern Washington. It was as warm, dry, and dusty as the picture implies. I was particularly apprehensive about the stretch between Brush Creek and Hart’s Pass. According to my map, there was no water source between Brush Creek and the stream just north of Hart’s Pass. Furthermore, there was a steep uphill climb out of Bush Creek to Glacier Pass and beyond, and I guess the climb above Glacier Pass would be exposed, sunny, and therefore hot (this guess turned out to be correct) (and it’s ironic that it was so hot, dry, and dusty around a place called ‘Glacier’ Pass, though Glacier Pass itself was a pleasant and shady spot which would have been a perfect rest stop if only it had a water source). By the way, the distance between Brush Creek and the stream just north of Hart’s Pass was 13 miles (21 km). So I had to decide – was I going to carry more water, which would make the uphill climb even more brutal, or would I carry less water, which would make the heat less bearable and increase my dehydration risk? I decided to carry just enough water and ration. The first few southbound hikers I quizzed confirmed that there were no water sources between Hart’s Pass and Brush Creek. Imagine my joy when I finally finished the brutal uphill – while rationing water – and the next set of southbound hikers I met told me I was only 2 miles away from a water source that was not described on my map. 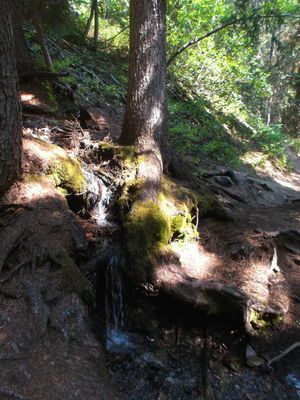 Hikers enjoy this fantastic water source between Brush Creek and Hart’s Pass. It was a surprise, and very much appreciated. I suppose some southbound hikers missed the water source because a) it’s not listed on maps and b) it is a few minutes’ walk off the trail. Anyway, it completely turned my mood around. Instead of rationing water, I was able to drink as much water as I pleased all the way to Hart’s Pass. Such luxury! It definitely made the sun and heat a lot more tolerable. When I first entered Canada, it was even hotter and drier than the US side of the border! I was thinking about how much it sucked that this was my first impression of Canada, and how I wanted to end the hike already – and then I reach this lovely water source in the shade. 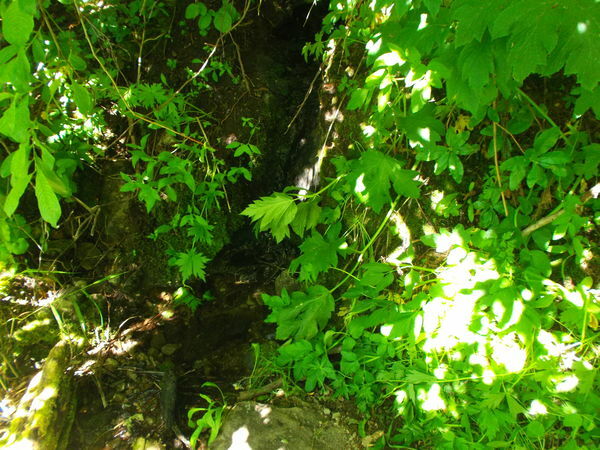 It was the first water source I used in Canada, and it greatly improved my mood. 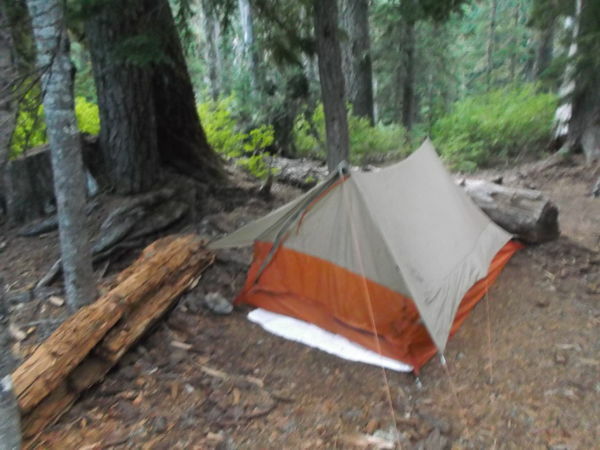 All that said, I never felt like I had to siesta, whereas I took siestas during most days of my hike on the Pacific Crest Trail in San Diego County, which meant that the heat in Washington was really not that bad. 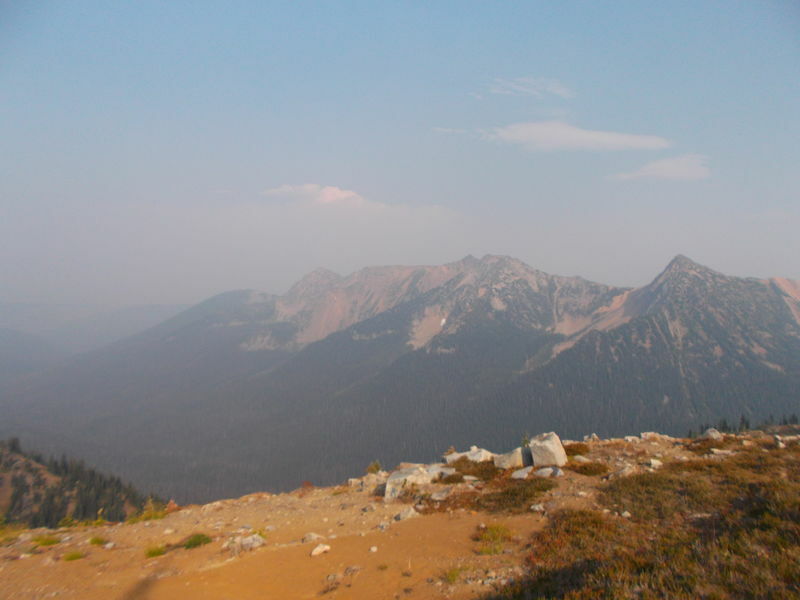 The only siesta I took in Washington was in Goat Rocks, and that was as much to replenish water, break up an uphill hike, and do some foot care, as to get out of the heat (though sitting in the shade for an hour and a half was still pretty nice). This little shady spot by a trickle, with enough room for exactly one person and no more, was where I took a siesta in Goat Rocks Wilderness. This was the first water source I had seen in five miles (with the exception of an unappealing pond). It was so nice here to sit under the plants and chill in the early afternoon. All in all, though Washington is generally more forgiving when it comes to water than the California Pacific Crest Trail, hikers still cannot take water for granted, not even in Northern Washington. I found that a bit disappointing, but I was used this type of hiking challenge. I met a lot of southbounders between Hart’s Pass and the USA/Canada border – a lot of them had come up there because Oregon was on fire and they heard that the weather in Washington had been particularly good for hikers this year. I was talking to one southbound hiker at Windy Pass (at the border of the Pasayten wilderness) and I asked him to guess how many time it had rained on my in Washington. He guessed ‘zero’. I told him it had rained on my twice. His response was ‘damn, I was hoping it hadn’t rained at all’. My campsite near Lemah Meadow, Alpine Lakes Wilderness, Central Washington. When I was in Snoqualmie Pass, the weather forecast said there was a chance of rain a couple days later. A day after I left Snoqualmie Pass, it rained in the morning as I went through Chikamin Ridge, one of the toughest PCT segments in Washington. Amazingly, the rain did not make the rocks slippery, for which I am grateful. I’m guessing the summer had been so dry that the rocks were able to drain very fast. In fact, the rain may have helped since a) it kept the temperature cool (the previous day had been very warm) on a very exposed ridge and b) it kept down the dust. Joe Lake, with Chikamin Ridge in the background, Alpine Lakes Wilderness, Central Washington. Then, according to word of mouth (which was my only source of news in the wilderness) the forecast had gotten more dire. Some hikers were saying that there was going to be a classic Washington downpour, which would flood the trail, making it very difficult to hike. Some experienced hikers told me just how awful heavy rain on the Pacific Crest Trail was. I said that if the rain was that bad I would just stay in my tent and not hike, and they said that plenty of hikers do that when the rain gets bad on the PCT. At first, I was irritated that this awful downpour was going to happen when I was in the wilderness and not when I was safely in town, but then I warmed up to the idea of resting in my tent in the morning instead of hiking. I had enough food to stop hiking for a half-day, books to read, and good company at the Lemah Meadow campsite, where I hunkered down, anticipated my first real Washington rain. The next morning, when it turned out the rain was just as light as it had been the previous morning, my first thought was ‘damn, I have to hike this morning after all’. I would have been fine if I hadn’t brought any rain gear at all during this 500 mile trek, and the little rain I experienced was as much an aide as a hindrance. Last year, I met Yoda at Carter Meadows Summit (in Northern California). 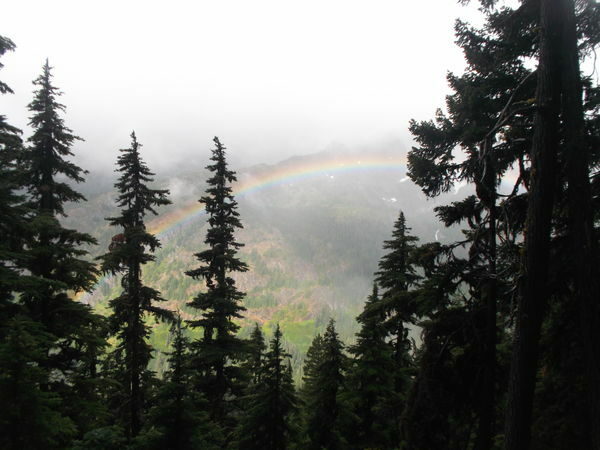 Here is her account of a rainy day on the Washington PCT. Though there was no lightning in my location (thank goodness!) 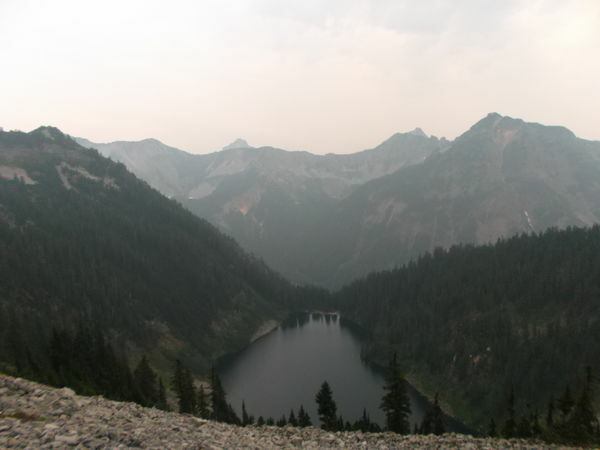 the very same storm which brought me the only rain I experienced on the Washington PCT also generated the lightning strikes which started the wildfires which eventually caused the PCT between Chinook Pass and Snoqualmie Pass to close. Thanks to the rain, I got to see some rainbows during the uphill hike above Lemah Meadow, Alpine Lakes Wilderness, Central Washington. I timed my hike to minimize my problems with snow. I wanted it to be late enough in summer that almost all of the snow would be melted – sometimes the trail is clear as early as June, but according to the southbound hikers I met, the trail only became passable at Hart’s Pass at around July 12 this year, and there was still plenty of snow on trail. But I also wanted to be early enough that I would have a 0% chance of running into a snowstorm even if I needed more time that I planned (snowstorms can start as early as mid-September). That meant hiking in August. The most snow I ever saw on the trail was at the appropriately named Old Snowy Mountain in the Goat Rocks Wilderness (yes, I took the Old Snowy Alternate route). Usually, the hiking season is ended by snowstorms. I met quite a few hikers in northern Washington who had attempted a thru-hike in a previous year, but they hit snowstorms in September/October, so they had to end their hike at the Suiattle River, Stehekin, Hart’s Pass, etc. (getting snowed out at Hart’s Pass is especially frustrating since it is so close to the end of the trail!) This year, the season was ended by fire, not snow. I was lucky in my timing in that I missed all of the fire closures. I also met a few thru-hikers who managed to complete the entire PCT this year without flipping (an AMAZING feat considering how much snow there was in the Sierras this year). However now it is fire, not snow, which is closing down the Washington PCT. Most of the Washington PCT is still open, but a continuous hike like I did is no longer possible, and will not be possible until next year. A few miles north of Urich Cabin / Government Meadow. So, even though I hiked the entire Pacific Crest Trail in Washington, I do not feel I had quite the ‘Washington’ experience since the challenges were more the type of challenges typical of the California PCT than the Washington PCT. This was very in-my-face evidence that climate change is already here. After my return to San Francisco, when I told some gardeners in my neighborhood that this is the summer that Washington turned into California, their response was ‘this is the summer that California turned into Arizona.’ My father – who tended our backyard while I was travelling – says that this summer was not particularly warm by local standards, but my own observations of the flora in the neighborhood does indicate that this summer was a bit unusual. North of Snoqualmie Pass, near the Kendall Katwalk, Alpine Lakes Wilderness, Central Washington. Posted on September 22, 2017 by Sara K.
This is part of the Rambling Series about Sexism in Jin Yong Stories. According to Goethe, “wer fremde Sprachen nicht kennt, weiß nichts von seiner eigenen” which means “those who know nothing of foreign languages know nothing of their own.” In English, we speak of fish learning to see water. Though I think it is possible to know something of one’s own language without knowing others, learning a different language is certainly a very powerful tool for become conscious of many aspects of one’s native language. Likewise, learning about another culture is a powerful tool for becoming more conscious of one’s own culture. By extension, observing patriarchy in another culture can be a very useful tool for better understanding patriarchy in one’s own culture. I think one of the things which has become apparent in this Rambling Series is that the sexism and misogyny in Jin Yong stories are sometimes similar to Anglophone pop sexism/misogyny, and sometimes different. Comparing the two is a way to learn a lot about patriarchy as expressed in Jin Yong’s stories (and to some extent, Chinese fiction in general, though not all Chinese writers are Jin Yong). It is just as effective for learning about patriarchy as expressed in Anglophone pop fiction. China, obviously, has been a patriarchal society for all of recorded history, though the nature of patriarchy has varied by region and over the course of the millennia. All large Anglophone societies are also patriarchal, and Anglophone patriarchy likewise varies by region and historical period. I admit, I am usually suspicious when a native Anglophone deplores Chinese cultures for how it treats women and girls, especially when it comes with the subtext that Anglophone society isn’t nearly so patriarchal (I am saying ‘Chinese’ rather than ‘Sinophone’ since most Anglophone natives don’t make that distinction!) It is true that there are some horrific misogynist practices which have existed in Chinese society which have not existed in Anglophone society. However, when someone is trying to show how Chinese society is so much more horrible to women and girls than Anglophone society, they tend to cherrypick their examples, and ignore all of the bad stuff Anglophone society does which Chinese society does not do. When it seems the point of the analysis is to understand patriarchy in both Anglophone and Sinophone societies, rather than to simply prove that Chinese society is bad, I am more inclined to take it seriously. There is another benefit to reading outside one’s culture. Since I grew up in the United States, my sore points when it comes to patriarchy have been shaped by American patriarchy. I’m not talking about when I’m doing feminism as an intellectual exercise – I’m talking about me trying to enjoy a story without necessarily examining it critically, and doing my best to ignore the sexism when each instance of that sexist trope YET AGAIN wears me out a little more. The sore points in Sinophone pop fiction for female readers are sometimes different. For example, female characters are much less likely to be visually sexualized in Sinophone pop culture than Anglophone pop culture. Sinophone pop sexism creates its own sore points, but when they are not the same points where Anglophone pop sexism has ground down on me, I’m not quiet so sore yet. Even though I’ve focused on comparative feminism and sexism, other aspects of culture can be compared, such as disability, or a zillion other things. However, to pull this off, one needs to expose oneself sufficiently to a culture other than one’s own. Posted on September 15, 2017 by Sara K.
The Columbia River, with the Bridge of the Gods in the background, as seen from Cascade Locks on July 24, 2017. 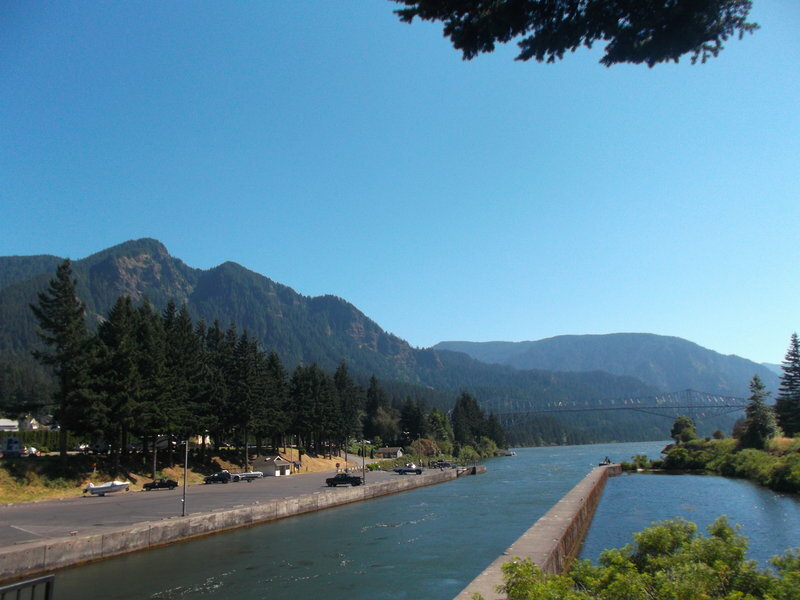 I started my 500 mile trek across the state of Washington in the town of Cascade Locks. 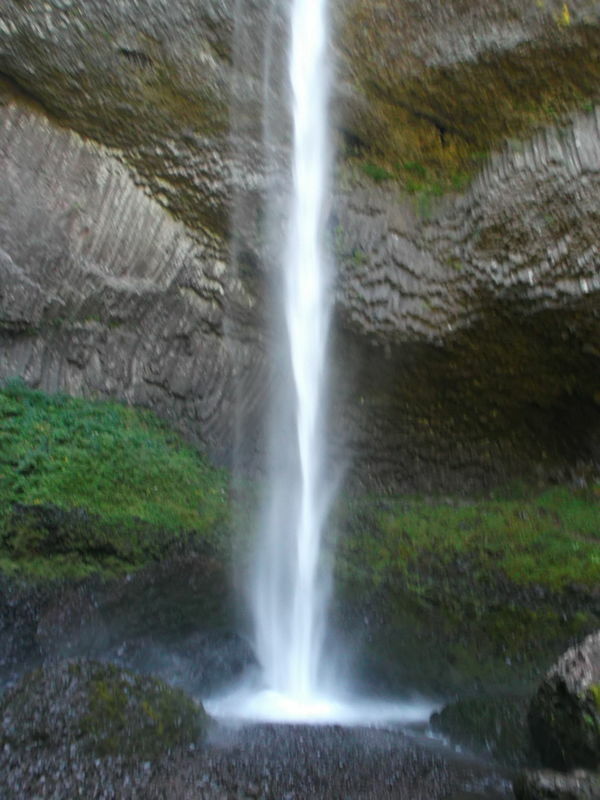 The day before my hike, a certain wonderful person (you know who you are) gave me a ride from Portland through the Columbia River Gorge, visiting several of the famous waterfalls. 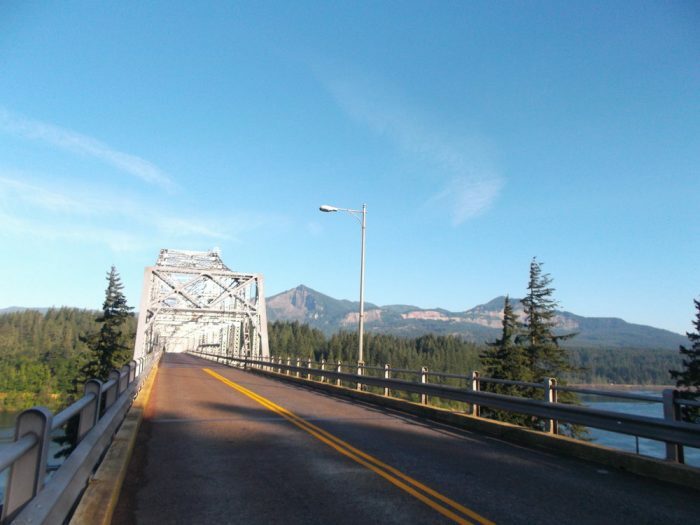 On day one of my hike, I traversed the Bridge of the Gods on foot, crossing the threshold into Washington. At the time, I was thinking about the beauty of the Columbia River Gorge, and how nice it would be to see more of the waterfalls on another trip to Oregon. One of the many fantastic waterfalls of the Columbia River Gorge. 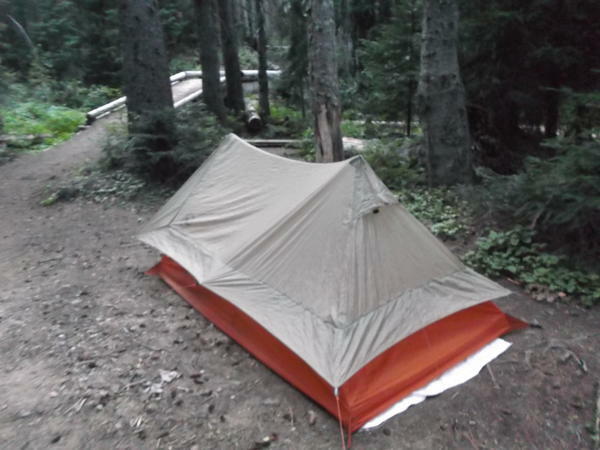 My tent in Cascade Locks on July 24, 2017. 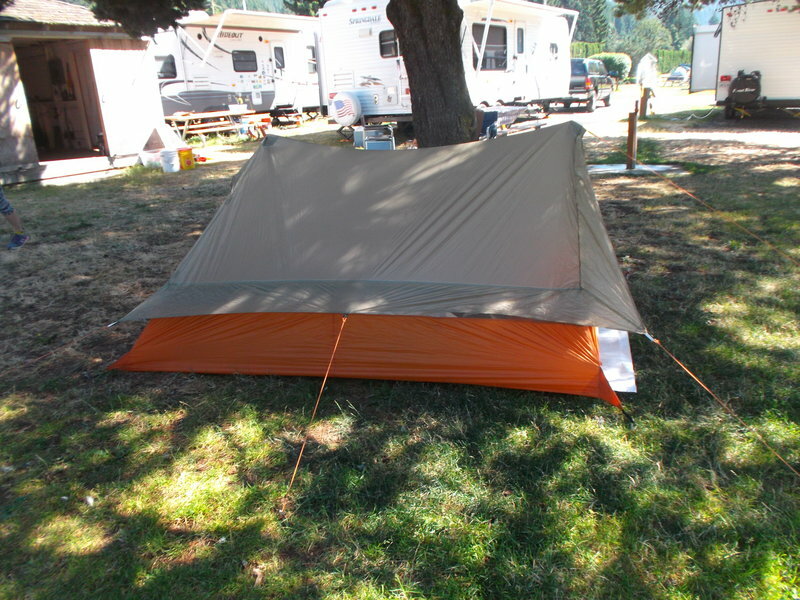 I slept in a tent because I didn’t want to pay for a motel room, but now some residents of Cascade Locks are sleeping in tents because of the evacuation order. Over a hundred hikers had to be evacuated around Cascade Locks. Most were day hikers or weekend hikers, but some were long-distance Pacific Crest Trail hikers – and I’ve read that some PCT hikers from Germany who did not have anywhere to go in the United States stayed in the same evacuation shelter as the displaced locals. If my luck and timing were different, I might have been one of the hikers who needed evacuated. This is a photo I took of the Bridge of the Gods on July 25, 2017. The photos of Cascade Locks from the past week feel very surreal to me. You can see an example of such a photo here. At this point, it is not known whether or not the town will be burned down. Right now the fire is slowing down and containment is increasing (as of the time of writing), but conditions could turn for the worse. The extent of the damage of the fire is also still unknown because it’s too dangerous to investigate, though one article says that firefighters need snow plows to get through the debris on the road. Fire is a completely ordinary part of the ecosystem in much of Oregon – but fires of this scale are not an ordinary part of the ecosystem in the Columbia River Gorge. This fire was only able to grow so big and so fast because this has been an exceptionally warm and dry summer in the Pacific Northwest. These warmer and drier summers are most likely part of broader changes in the climate, some of which have been caused by putting greenhouse gases in the atmosphere. And this is just the prelude of climate change. If this is the prelude, I don’t want to see the climax, but I also know it’s inevitable because we have failed to prevent climate change (it’s already here) and we refuse to take the actions which would slow it down. Therefore, we are going to have to take climate change as it comes, whether we like it or not. 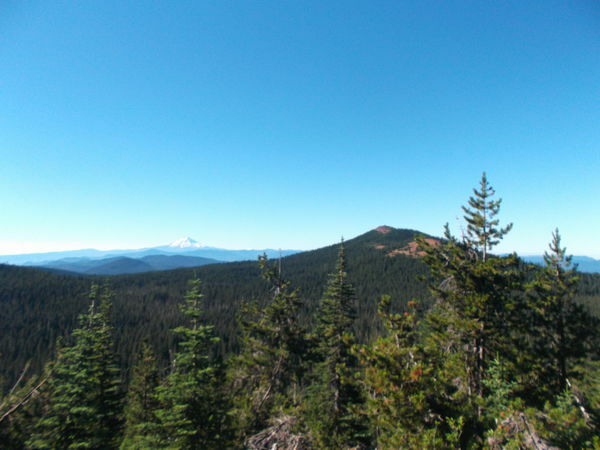 Here is a good essay about climate change and the Pacific Crest Trail. Looking towards the Diamond Creek fire from Lakeview Ridge on August 28, 2017. And there are much bigger fires raging across the Pacific Northwest right now. The fire around Cascade Locks is the highest priority because it is an immediate threat to a town, but out in the wildernesses of Oregon and Washington there are much bigger blazes. The Diamond Creek fire – which I had to pass – is about three times bigger. 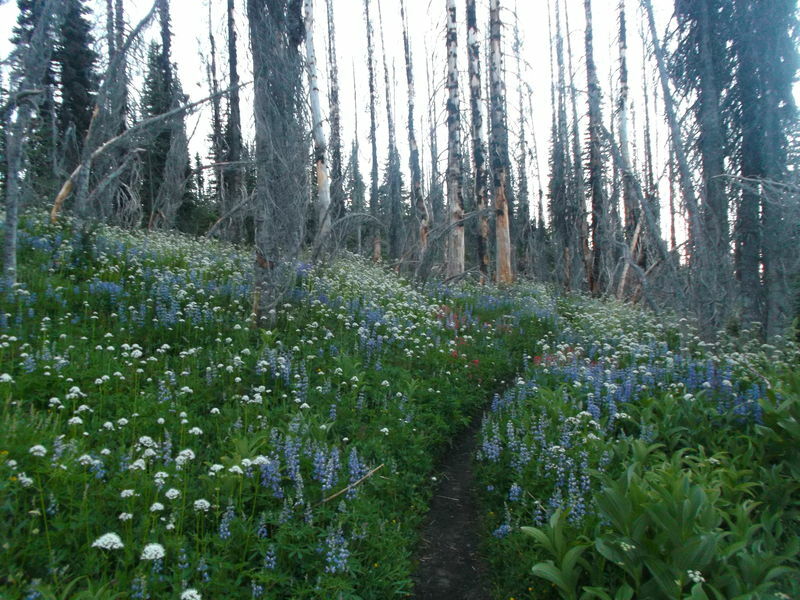 For weeks, I was wondering if the Diamond Creek fire would force me off trail, but the Pacific Crest Trail stayed open. The trail is still open as of the time of writing, but they just closed the Hart’s Pass road because of the fire. That’s a big deal, because the Hart’s Pass road is the only road access to the Pacific Crest Trail between Rainy Pass and Manning Park, and the best escape route beyond Rainy Pass if anything goes seriously wrong. There were a lot of people at Hart’s Pass when I passed through, and a lot of them needed that road. 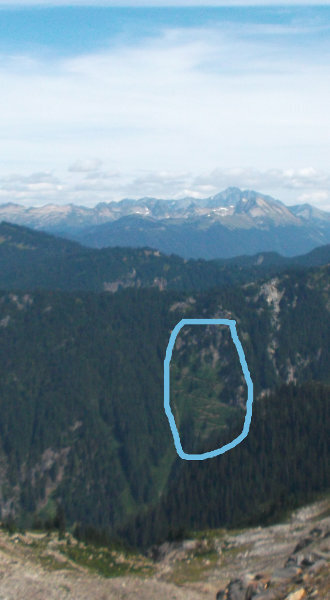 Furthermore, all of the escape routes east of the Pacific Crest Trail north of Rainy Pass are now closed because of the fire, and all of the escape routes to the west are long and difficult. On top of that, many hikers cannot legally enter Canada, so if they are forced off the trail because of the fire, they might have to hike over 50 miles (possibly over very difficult trail) to get out of the woods (or they could enter Canada illegally). Worst of all, the Diamond Creek fire is getting so big that the town of Mazama is under evacuation notice – the residents are not required to leave yet, but they may be required to leave at any time. I did not go to Mazama, but I did camp next to the Methow River (the river is under the bridge in the photo) which eventually flows to Mazama. Even though Diamond Creek fire was not a direct threat when I went through Paysaten, and the Hart’s Pass road was still open, I definitely inhaled some smoke from that fire. Coincidently, the Diamond Creek fire crossed the border into Canada on the same day I did, so it’s now burning in both Washington and British Columbia – and since it was already the worst fire season in British Columbia history, they really did not need to import a fire from the USA. Look at all of that haze generated by the Diamond Creek fire (photo taken at Lakeview Ridge on August 28, 2017). However, after the worst is over … there will be a recovery. It may not be a full recovery, and some things will be lost forever. Nonetheless, there will be some kind of recovery. My hometown, San Francisco, was notoriously destroyed by a fire and it recovered – eventually. 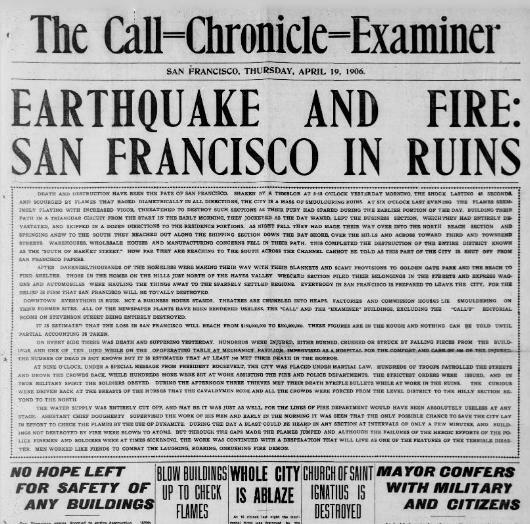 This was the front page of the San Francisco Chronicle AND San Francisco Examiner on April 19, 1906. It had to be printed in Oakland because all of the newspaper printing presses in San Francisco had been destroyed. You can read the article here. I will end this with a picture from the Mt. Adams wilderness. The area around Mt. Adams burned in 2015. It’s still an obviously scorched area. And now that all of the tall trees are dead, there in an abundance of sunlight which is allowing the wild flowers to explode with growth and color. Meanwhile, there are many saplings which will, in time, restore the forest. Since the Columbia River Gorge has a very different environment from Mt. Adams, the fire there is not going to have the same effect. Still, even though something wonderful and special is being lost, and no doubt some people’s lives are going to be ruined, perhaps there will be a silver lining. Wildflowers growing in a forest which burned in 2015. Posted on September 8, 2017 by Sara K.
So, I wrote a short post called I AM IN CANADA!!!! on a smartphone I borrowed from someone else … and somehow WordPress ate the post and only put the link. I could try to re-write the post and have it be as I originally intended, but you know what? The way that post got eaten totally reflects my first week in Canada. I hiked into Canada, over 25 miles from the nearest road on the US side of the border (more than 40 miles to the nearest US highway) and more than 5 miles from the nearest ATV road in Canada, with further miles to the first *highway* in Canada. I crossed the border on August 29. I entered Canada with no phone, computer, or other electronic device which can be used for communication (except my beacon, which can only send distress signals, not connect to the internet or phone network). Canada is hot and smoky, especially near that border crossing. To be fair, though the Canada side of the border was hotter (yes, it’s hotter on the Canada side than the USA side) the air seemed to be cleaner, probably because I was just a little further from the Diamond Creek wildfire. I arrived in Canada midweek (Tuesday, to be specific), so it would be okay to do reservations at the last minute, right? HA HA HA HA HA HA HA HA HA HA HA HA HA HA!!!!!!!!!!!!!!!!!!!!!!!!!!!!!!!! First of all, the public computer at Manning Park wasn’t working, so it was more than 24 hours before I could access the Greyhound website … only to find out that the Greyhound bus was sold out (if I had gotten internet access JUST A FEW HOURS EARLIER, I would have been able to buy a ticket). But that’s just as well, because the Greyhound only serves Manning Park at 2 am … except it’s usually a few hours late. And then it got booked solid for a few days in a row, which is a problem for hikers who can’t arranged to be picked up in Manning Park and also cannot reserve bus tickets in advance because they are not sure what day they will be in Manning Park. The staff at Manning Park were very surprised that the Greyhound bus was sold out – they said it sometimes sells out on weekends, but almost never midweek. Oh, and Labor Day weekend was coming up. Apparently, Canada has the same Labor Day as the USA, rather than celebrating Labor Day on May 1st. Who knew? (Okay, I suppose Canadians knew that). ALL THE HOSTELS IN VANCOUVER WERE BOOKED SOLID!!!!! ALL OF THEM!!!!! ALL THE HOSTELS ON VANCOUVER ISLAND WERE BOOKED SOLID TOO!!!! While Manning Park is a nice place, I did not want to get stuck there. So I booked the one hostel in the Vancouver region which had space that weekend – on Denman Island. Then I had to get to Denman Island, and since Greyhound was not an option, that left … hitchhiking. This is where my luck turned around. I spent a few hours begging for a ride at Manning Park, only to learn that 95% of the traffic was going east, not west to Vancouver. Finally, a guy stopped for a cup of coffee, had room in his truck for a passenger and … his destination was Denman Island, because he lives there (BTW, Denman Island has a population of about 1000 people, give or take a few hundred). THIS WAS SUPER LUCKY!!!!! That’s how I got from Manning Park to Denman Island. That guy was a true trail angel. Anyway, I loved spending the long weekend on Denman Island. It was totally chill, and I probably enjoyed it more than I would have enjoyed the city. Now, I am finally in downtown Vancouver. While Denman Island was definitely a more gradual way to transition away from life on the Pacific Crest Trail, I am a city native. I think that even if, as soon as I got off the Pacific Crest Trail, someone had given me a ride straight to the heart of Vancouver, I would have still taken to it like a duck to water. Whereas I have to adjust to life on the Pacific Crest Trail, I don’t have to do much to psychologically adjust to a city on the western coast of North America. That said, I would not have wanted to get from Manning Park straight back home to San Francisco without a cool-down period. And the Vancouver hostel has a computer with internet access, which is how I am able to write this blog post. MEANWHILE… three sections of the Pacific Crest Trail which I hiked during this very trip – a total of about 130 miles – are currently closed due to wildfires. Furthermore, I’ve read that Cascade Locks, the town where I started the 500 mile trek, has been evacuated. I am grateful that I never had to deal with fire closures – or deal with a wildfire up close. Posted on September 1, 2017 by Sara K.
Some people might claim that Jin Yong wrote put sexism/misogyny into his stories because he was a product of his time (the 1950s – 1970s) and his society (China / Hong Kong). On some level, this is true: China / Hong Kong is a patriarchal society, and if it were not, then there probably would have been a lot less sexism/misogyny in his stories. However, I don’t think ‘Jin Yong is a product of his time and place’ is a sufficient explanation. Why not? One of the shortest answers is: Liang Yusheng. Liang Yusheng was another popular wuxia writer from Hong Kong in the middle of the 20th century (in fact, he’s the one who encouraged Jin Yong to start writing wuxia in the first place). A lot of Liang Yusheng stories have a female character as the lead protagonist (whereas Jin Yong only wrote one novella with a female lead protagonist). Furthermore, many of the problems I’ve been describing with how Jin Yong treats his female characters don’t apply to Liang Yusheng’s stories, or don’t apply nearly as often. Liang Yusheng’s most famous story is The White-Haired Demoness, also known in English as Romance of the White-Haired Maiden and The Bride with White Hair. While much of the novel is mediocre, the lead character, Lian Nichang, is one of the most memorable characters is all of wuxia, and I think that’s the reason why they still make new adaptations of the novel to this day (I haven’t seen any of them, but the one I’d be most interested in giving a try is the one starring Ada Choi). She was raised by wolves, so she doesn’t understand why people do such silly things, such as claim that men and women can’t be friends without being lovers (she becomes friends with men, because why the heck not?) 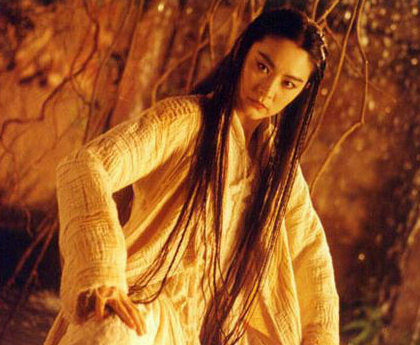 She is so iconic that it’s difficult to have a broad discussion of female characters in the the wuxia genre without mentioning her. Much of the story is about Lian Nichang’s romance with a male character – but unlike Jin Yong’s novels, she’s not there to stimulate his character development; he’s there to stimulate her character development. It’s not a problem that female character fall in love and have romances; it’s a problem that most wuxia stories use romance to subsume the female character into the male character’s story. Now, there is nothing intrinsically wrong with have a lead male character. What I DO want is to have a roughly equal mix of stories with a lead male character and a lead female character – and that’s not how it is in wuxia (with the exception of Liang Yusheng’s stories). This becomes even more starkly obvious when we talk specifically about trans female characters. In the stories of both Jin Yong and Gu Long (Gu Long is the third of the really famous mid-20th century wuxia writers, alongside Jin Yong and Liang Yusheng), all trans women are villains. Furthermore, their trans status is used as evidence of their evil. If you ever need an example of how NOT to write trans women into fiction, I suggest both The Smiling Proud Wanderer (笑傲江湖) by Jin Yong and Two Peerless Heroes (絕代雙驕) by Gu Long. By contrast, in Seven Swords (七劍下天山) by Liang Yusheng, there is a trans woman who is not an antagonist. Sure, she’s just a minor character, but at least she’s not associated with evil. Liang Yusheng came from the same social and cultural milieu as Jin Yong, and was writing wuxia during the same time period. This shows that Jin Yong could have chosen to be less sexist and non-misogynist, and have female lead protagonists. Instead, he chose to be more sexist and misogynist, and only put a lead female protagonist in a single novella. Thus, Jin Yong’s time and place is an insufficient explanation of why there is sexism and misogyny in his stories.